When sixth-grader Rosie Saunders asks her best friend, Kayo Benton, to come along on her family's summer trip, the girls look forward to a perfect vacation. Their first stop is a campground in the colorful Arizona desert, where Rosie and Kayo busily explore trails lined with the almost-human forms of the Saguaro cactus. Soon they have found a new animal friend, too: a tiny abandoned kitten. But the eerie shapes of the giant plants aren't the only spooky things in the desert. Kidnappers looking for the daughter of a wealthy businessman grab Kayo by mistake. Now, instead of trying to find a home for the kitten, Rosie desperately searches for a way to rescue Kayo from the two rough men who have carried her away into the desert night. 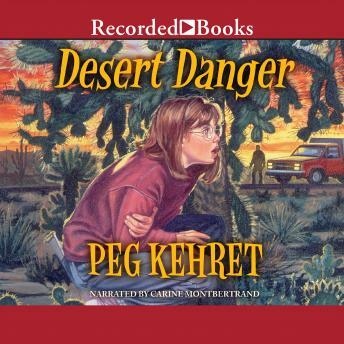 In each addition to the Frightmare series, Peg Kehret provides plenty of suspense while the two girls' love for animals leads them into perilous adventures. The nonstop action will whisk you through Desert Danger at a hair-raising pace.